(1) All Subjects are based on National and TEA standards, guidelines, and current texts. (2) All math courses are started from summer session and completed by spring semester. 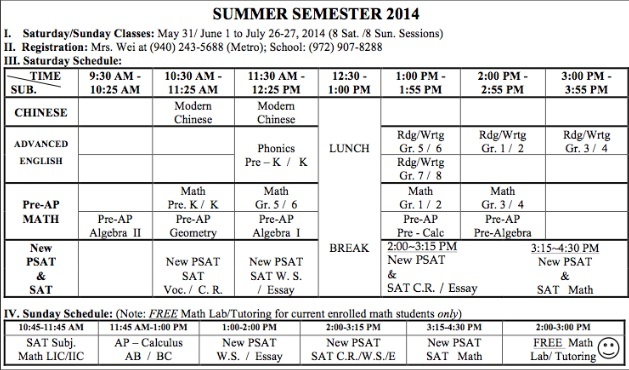 (3) Make-up work for students who missed summer /or fall sessions is student’s sole responsibility. *Special collections of books priced higher. Please note: We will not be holding classes on Sundays for Summer 2018. AP Calculus has been moved to Saturdays. Change to Schedule: We will not be holding classes on Sundays for Spring 2018. AP Calculus has be moved to 1 pm on Saturdays. If you have already registered for Sunday classes, we will be reaching out to you. Thank you. Register now for Spring 2015 classes! Register for Summer 2014 DCS Classes now! REGISTER ON OR BEFORE May 11, 2014 FOR EARLY RATE! New! Required Email System for Parents. If you registered for classes, you should have received information about our new required email alert system. Signing the notice on paper alone does NOT sign you up for our email system. Please enroll and submit your contact information ONLINE here for our emergency contact and alert system and enter your contact information. You must enter in your contact information online so that we can send you for any urgent emails regarding inclement weather or other urgent school issues. Please note: If there are any school cancellations or emergencies, we will notify the emergency contact person by email ONLY and will post on our website. We will not be calling every household individually. If you do not sign up for this system, you may not receive notice of important information or changes in our schedule due to inclement weather.